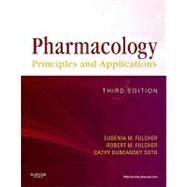 , by Fulcher, Eugenia M.
Comprehensive yet easy to read, Pharmacology: Principles and Applications, 3rd Edition introduces you to basic pharmacology, showing how to apply principles to the kinds of clinical situations you will encounter on the job. You'll learn how different drugs work in the body, how to calculate drug dosages, drug administration routes and procedures, the medications related to disorders in each body system, and much more. Written by expert authors Eugenia M. Fulcher, Robert M. Fulcher, and Cathy Dubeansky Soto, Pharmacology ensures that you master all of the pharmacology competencies required by CAAHEP and ABHES. In the book and on a companion Evolve website, a variety of exercises helps you strengthen your skills in math, dosage calculation, and critical thinking. Practical coverage of basic pharmacology provides a thorough understanding of the medications most commonly used in ambulatory and inpatient settings. A real-life Scenario starts each chapter with thought-provoking questions to consider as you progress through the material. Procedures boxes provide step-by-step guidance for drug calculation and administration, accompanied by numerous illustrations and icons that identify OSHA-mandated protocols. Common Signs & Symptoms of Diseases and Common Side Effects of Medications lists in each body system chapter help you distinguish between disease progression and medication reactions. Body systems icons highlight the ways that specific drugs affect a particular body system. Chapter objectives and key words at the beginning of each chapter help you focus your study efforts. Check Your Understanding math review sections enable you to assess your knowledge of application and calculation concepts. Critical Thinking exercises challenge you to apply what you've learned to a variety of realistic situations. Important Facts and Clinical Tips boxes in each chapter highlight the key concepts for practice. Patient Education for Compliance boxes help you communicate more effectively with patients about possible side effects or adverse reactions. Summary tables are more concise and easier to follow. New calculations exercises and quizzes are included on the companion Evolve website. Expanded math and drug calculation sections in the workbook supplement the textbook with additional exercises for practice with math and dosage calculations. Available separately.